In case if you have not read the previous CNL’s, please visit www.coachshiv.com and click on the tab on the top right side “coaching newsletter”. And you will find the link to all the previous issues. As all these CNL’s are interlinked and interdependent, like building blocks. It may be hard, for some of you, to understand the topics covered in this issue and the ones in the future, especially the game concepts and the terminology, as they are different and new. Our game has changed with every passing decade. In most departments it has not only changed but has also improved vastly. Change is the law of the nature. This also does not mean that every change translates into improvement. Especially, when it comes fast, without investing much wise thought into it. Than followed as such, by the masses. Overlooking key principles, which govern the game. In these circumstances, negative side effects are bound to happen. Especially when we keep on moving, and that also at the speed of a bullet train, without stopping to pause and reflect, and see how we are doing? And without being aware, of this is not a good idea. This is what has happened to our game to a certain degree. As along the way, we have discarded some valuable principle based proven strategies and tactics and some pearls of our game. IOW tactical creativity. This is what we are going to uncover and cover in this article. Old saying; Slow and steady wins the race, is still valid. This mantra has been adopted by the successful Fortune 500 companies in the business world and too in sports like Basketball and Football. Than why not in hockey. The only exception where it may not apply is the 100 meters Olympic Games final sprint. Present Situation: What’s going on and, where are we? Self-Analysis: What we have been doing has worked or not and to what degree? Have we turned a blind eye to what has not worked, as effectively as we had anticipated? Self-Awareness: Are we aware of this? What it is? How and where can we learn to know, what to do more and what to do less and why? Know how: What exactly needs to be done differently, to be more effective and why? 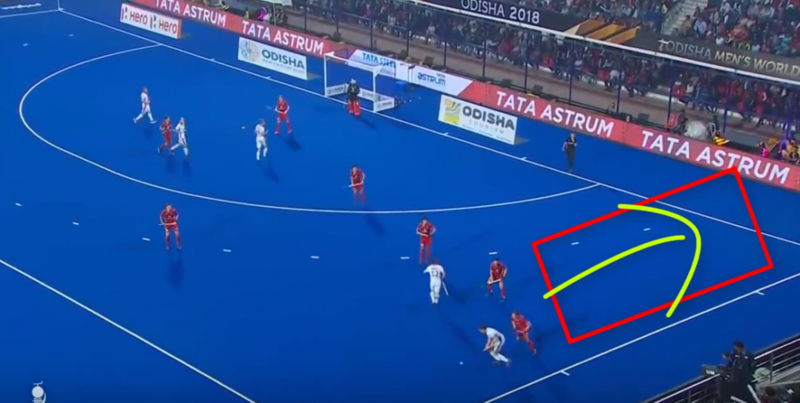 Solutions: Keeping in mind the recently concluded 2018 Odisha HWC, I will address the above burning questions, with examples from the various specific game situations. Searching for solutions, from my long-term memory bank, which has an accumulation with compound interest, of more than 50 years, experience. Not trying to brag, just to make a point. Most solutions are based upon Soft Skills - Artistic moves and plays. Showing how science, power, grace and artistic hockey can all still be blended nicely. Taking the best from the old to match it with the new. Yes, also striking an optimum balance of the hard and soft skills. The game is changing and improving! We have started moving slowly but steadily in the right direction of playing tactical creative hockey. This was demonstrated, by only the top teams, and that also in patches, by some key players. One could notice its powerful impact instantly. To see and understand it, one must have an eye to recognize the difference between a rock and a diamond. So, we don’t misjudge the either. Most teams and their coaches are still figuring out, ways to design and stitch their strategic game plan, the old-fashioned way. Based upon the Hit and Hope strategy. Sadly, there is a big knowledge gap in our game. The Positives: We saw the following traditional skills being implemented more. In a way making a comeback. 1. Hitting the ball more. Smoothness, pace and accuracy of it needs to be refined. It sure will come in the coming years. If a picture is worth a thousand words, then a video is worth a million.. Here is a video clip link, courtesy Star Sports. 2. Pushing the ball more, while attacking near and around the opponents 23 meters line. Beautiful! Please refer to the video clip under heading #5 semi penetrating dodges. 3. Awesome Scoops, the way players put pace height and accuracy, as demanded by the given game situation. This skill was implemented not only to release the pressure, from the deep defense but also to generate a attack. 4. Tackling: Lunge and tackling from the left, especially with left hand only. To intercept through passes. Classic example was the way Germany implemented them to thrash the silver medalist Netherlands, by a margin of 4-1, during their pool match. 5. 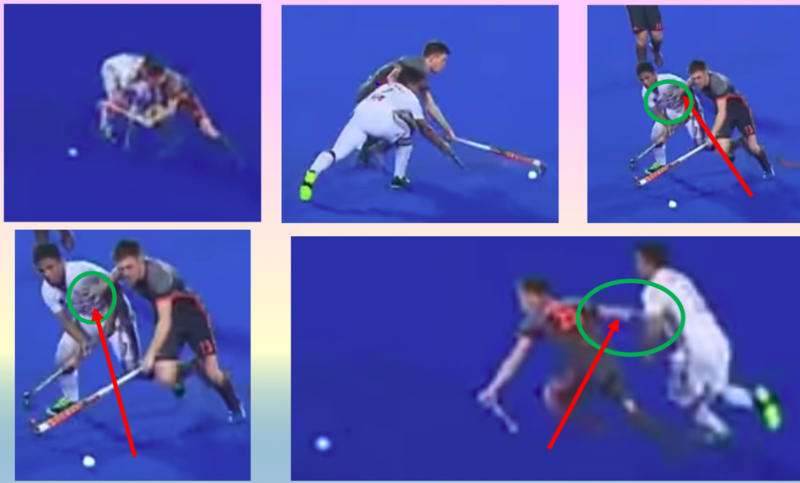 Semi penetrating dodges: The way Belgium scored their winning goal against Germany in the critical quarter final match. One can see the magic of Soft Skills. The Belgium Player just dropped his right shoulder to fake a pass to his right and cut in. The German defender took the bait. And the mighty Germans defense fell apart like a house of cards. 6. Deflections: During the early part of the tournament, we saw some beautiful one touch deflections from the midfield players, to their leading forwards, to create goal scoring opportunities. They vanished slowly as the tournament progressed. Below is a photo sequence, which resulted in a goal with 4 passes. Spain’s R.F. passes the ball to his R.H., who passes it to his R.I. to deflect it first time to his leading L.W., to take a try, resulting in a marvelous goal from a rebound. Please refer to the photo sequence #1 & #2 below. 7. Elimination Skills: Beautiful elimination skills to turn the defender inside out. 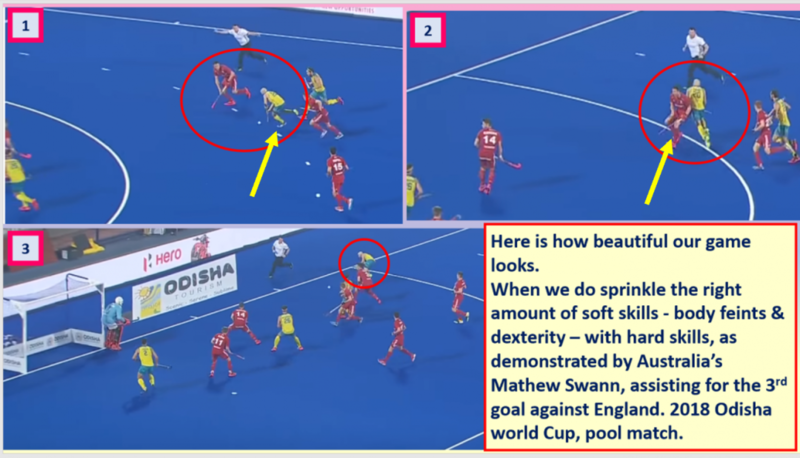 The way the Aussie, Mathew Swann did this to the England defender, in the Right Offensive Quadrant (ROQ), during their pool match to assist their third field goal, in the fourth quarter. Please refer to the photo sequence #3 below. Here are the Top 7 Tactical and Technical skills, which when learned and applied will serve our teams immensely. They sure are missing from our repertoire. They are excellent substitutes to some of the overused hard skills, which also have been being Implemented at the wrong time and place. A classic case of a right tactic applied at the wrong time. Yes, this has back fired, without the applicant’s being aware of it. Remember the old-adage; Excess of everything is bad. 1. Unnecessarily running with the ball, forgetting that the ball travels faster than a player. If you are super fit, this does not mean that you must keep running with the ball blindly, and then loose it. To run again at full speed to recover, while doing reverse tackling. A rat race; the way most of us, the citizens of the western world lead their life. Please note, there is a big difference between running with the ball out of fear of losing it, then with the desire, to make something creative happen. In the following video clip below, it appears that the German player is running speedily out of fear, covering 15 – 20 meters. So, he may not be reverse tackled by the chasing Belgium player. No harm running fast, but equally important is to THINK FAST. If you can’t do the both simultaneously, it is better to slow down, but do think fast and calmly. Using one’s brain more than one’s legs. Moreover, when you will slow down, you will be able to scan the field better, to make effective decisions. Here is the video clip link. Courtesy Star Sports. Lesson #1: Ball travels faster than the player. Quote: You play football with your head, and your legs are there to help you. -Johan Cruyff, Dutch legend, the brain behind Barcelona FC’s Success. Isn’t it the other way around now? Do the current Dutch silver medal winning players, follow the philosophical advice of their national hero? You be the judge? Quote: It’s better to have 10 disorganized people who can play football than 10 organized people who just run. -Roberta Baggio, the Italian star forward, commented when he saw the coaches preferring total physical fitness over natural skill, as football was losing its artistry. Isn’t this the case also, with our game to a large extent? 2. Unnecessarily receiving the ball with one’s back towards the attacking goal. Further, to add insult to injury spin with it in a circle, whereas sometimes, there is no need for it, as there are no opponents nearby, to challenge. It is a classic example of an easiest way to convert a simple game situation, into a complex one. Is this due to a defensive mindset? Please refer to the video clip, under heading #7. The last five crucial minutes of the match. Lesson #2: Higher the risk, higher the reward. Take calculated risks. We talk about ‘receiving’ the ball whereas Barry prefers the notion of ‘collecting the ball’, efficiently and ON THE MOVE. Players need to understand the purpose behind ‘collecting the ball. An essential part of collection is awareness of what happens next. The player collecting the ball needs to see the next pass, and have ‘shared vision’ with the next player leading to collect that next pass. It is about ‘connectedness’ BEFORE the player receives the ball. 3. Spinning from one’s strong side to weak side, to execute a Tomahawk. Tomahawk is one of the best and the worst things, which has happened to our game. It has robbed us from so many valuable skills, which could have been developed. Especially, for our younger generation player’s development, as an all-round hockey player has been handy capped. As they believe, learning to execute a Tomahawk or learning to execute a drag flick, is their ticket to the top. Tomahawks have more flash than class. Unfortunately, our innocent players/coaches believe, that this is the only way to score a goal, from the Left Offensive Quadrant (LOQ) of the circle. Nothing can be further from the truth. No question, we have seen marvelous goals scored from this skill. And pin point crosses coming from the right and left, to be deflected in to goals. I also strongly feel that it has hurt us severely, when it mattered the most. As the principle of strong side vs weak side is compromised. Strategically the forward is going to the strong side of the defender and one’s week side. On top of this, limiting one’s clear view of the goal and the field. Contradicting ourselves. Shining Example: Jeroen Hertzberger, Dutch goal scoring machine, scored two goals, by beautifully dodging to his right, during the shootout against Australia and Belgium, in the semifinal and final matches, respectively. Don’t forget he also lost the last shootout contest, when he went to his left, to execute a Tomahawk. Didn’t it bite him and his team the most, when it mattered the most? You be the judge? See Highlights on You tube, if you don’t believe me. Secondly, we don’t realize, when we spin clock wise or anti clock wise to execute a Tomahawk, how we lose some other quality options to score a goal.EG Make a soft pass to teammates, who are and may be better positioned, to score a goal. Tomahawk does not generally allow, the player to change his mind, at the last fraction of a second, to make a different move. Employing a surprise element tactic. There is more than one way to score a goal from this specific zone of the circle. Please look out for my coaching staff’s next quarterly CNL #10. It is going to cover this core theme. Lesson #3: First understand the strength of the strong side vs the weak side. Implement your strengths. Secondly, have a contingency plan and skills to achieve your goals. Quote: Players today can only shoot with their laces. I could shoot with the inside, laces, and outside of both the feed. In other words, I was six times better than today’s players. - Johann Cruyff, the Dutch legend. Quote: If the only tool you have is a hammer, you tend to see every problem as a nail. 4. Leading and Receiving the ball on the run, rather than in a static position, especially in the opponents attacking zone, where it matters the most. Yes, when the risks are higher, so are the rewards. Focus upon the rewards and not the penalties of failure. Our star players also need to learn to run off the ball, at an angle to receive the pass and face the opponent’s heads on, with an open offensive stance. Taking the bull by the horns. Please refer to the video clip, between Belgium vs Germany, under heading #7, titled the last 5 minutes of the game. Here is a simple drill for the forwards to practice receiving a pass coming from the left and right shoulder, in an open offensive stance, in a simulated game situation. Teach this skill to the players, when they are in their early teens, rather than teaching them how to spin in a circle. Unfortunately, recently I saw a video clip on the Facebook, posted by a top coach teaching the budding stars, how to spin and spin in circles and get dizzy. Not fair. We are not doing justice to our future generation of hockey players. Think about it. Lesson #4: If you work harder before you receive the ball, you will have to work less hard, when you receive the ball. Here is the photo of the game situation, where the German player could have applied this technique. 5. Receiving the ball as a forward in a 12 – 16 inches circumference, rather than making a big loop to receive it. By doing so the ideal angles to pass the ball diminish, while effecting the quality of the pass. Moreover, it gives a chance for the opponents to recover and have more numbers in the defense. Please refer to the video clip under heading 4. offensive stance. Lesson #5: During a game every inch and second makes a difference. Be thoughtful of implementing this concept, efficiently and effectively. 6. Thinking in the 4 quadrants: Present situational awareness. Our players need to clearly understand, in which part – Zone - of the field they are? And in which phase of the match they are? Make wise decisions. Hard to believe, even the top players make these rookie mistakes. These are not execution errors but learning errors. As we coaches’ have not taught them to THINK, the right way, while playing in the respective quadrants of the field. Please refer to the video clip under heading #7. Note when the Belgium player made a turnover in their 23, while coming out of their defensive zone. Germany did not punish them for this mistake and let them off the hook. Please refer to the photo sequence #4 below. Whereas Germany punished Australia, nearly from the same game situation during the 2012 London Olympic Games semifinal match. As they did to New Zealand, during the 2016 Rio Olympic Games quarter final, for the match winner, with less than 2 seconds to go. In New Zealand’s case it happened just after Germany scored the equalizer, with less than a minute to go. The New Zealand midfielder ran with the ball and tried to pass, which was intercepted, and a counter launched. Message is; start developing more intelligent and effective players, from the Elite Youth Development Program. We know, Ramesh Patel, is the brain behind, their National Coaching Structure. I hope he can still teach the younger generation of players and coaches the tactical creativity. Just the way he and his teammates demonstrated, during the 70’s, until the 1984 LA Olympic Games, where he played, exceptionally well as a Left Inner. Below are the two photo clips #5 and 6 referring to the London and Rio Olympic Games, respectively. Please study them closely, as I have not added descriptions. Lesson #6: Self-Awareness. Be aware, where you are on the field and what you want to achieve in the given game situation? Think and imagine; what really the player, playing in this position (situation) will do to fulfill his role and responsibility? Some players don’t take risk, when it must be taken, as the rewards are multifold. In the opponents 23. And do take risk, when it should not be taken. In their own 23, as the penalties are too severe. Especially after repelling an attack. A small mistake can hurt you severely. Know when to play a through pass, when to play a square and when to play a negative pass. IOW, you must know; when to take the bull by the horns and when to tame it gently. Timing is everything. Quote: Be fearless but not careless. - Sachin Tendulkar. Legendry cricketer, who holds the record as the highest run scorer of all time. 7. Unnecessary copping out - when the hay is in the barn - by making an easy back pass to the deep defender, and afraid to take risk. Delays are dangerous. Know when to pick your battle’s. Please don’t get me wrong. There is a time and place, to circulate the ball in the back and make a negative pass to maintain the possession or control the game. There comes an opportunity, which should not be let go, at lease to take a try and test the waters. Lesson #7: Make hay while the sun shines. Here is the video link, Courtesy Star Sports. Various other team tactics and factors also come into play. For Example; the Final between Belgium and Netherlands, was a beauty to watch. Unfortunately, both teams had no rest day after their semifinals. When the European teams play the smaller sized Asians, they take full advantage of their superior Physique (physical strength), size and reach. Why not? For Example: Netherlands vs Malaysia pool match. Netherlands thrashed Malaysia 7 - 0. Didn’t they out run them, and took full advantage of their superior physique. And gang tackled them successfully - sometimes even deliberately pushing them; sophisticated cheating, so the umpires can’t see - which resulted in turnovers and field goals. See photo sequence #7 below. You be the judge? What is fair and what is not fair. Quote: But when it comes to physique and other physical elements of the game we can’t always fight on equal terms. - Akira Nishino, Head Coach, Japanese football team commenting upon his opponents, before the 2018 FIFA world cup. Quote: I think we fought well against Poland. Its positive that we didn’t give up even though we were two goals down. It’s also encouraging that we were able to score two goals against the opposing players with good physique. What should Asian teams do to counter this? My suggestion with all due respect: Asian teams should avoid imitating totally the European style of play, tactical wise. Just pick their good points. Remember, Asian’s can’t beat them implementing their total game plan and style of play. Asians are gifted with unique qualities. They should optimize its utilization for one’s advantage. Think of FC Barcelona players and their size. They dominated the world with intelligent play and not by brute force and aimless running. I am still waiting to see a coach, who has the courage to leave at least one striker floating up in the opponents deep defensive zone. Instructing him to, not worry about defending at all. See the reaction of the opponents, what will they do? How do they cope with it? I am not suggesting that this must be done, for the whole game. Just employ it during the run of play, to catch the opponents by surprise. It may back fire or it may harvest rich dividends, depending upon the team’s defensive structure, skills and coping strategies. Especially, when they are outnumbered in certain game situations. It is worth a strategy being explored, during various phases of the game. 3. Penalty Corner conversion: Using a pin point hits to convert Penalty corner goals. I have seen some teams doing so in the recent past, but not consistently. It appeared Dutch were not as successful in converting penalty corners, as usually as they are. Why not ask Dr Floris Jan Bovelander, to come and show them how it is done? Same applies to the mighty Germans, who are slowly losing their supremacy in world hockey. They have Dr Carsten Fisher, to teach the younger generation of players, how to hit the ball hard and smooth. I vividly remember, Carsten hitting a 70 – 80 meters long range pass to his leading forwards, through a jungle of opponents. Another player who could thread a needle, like them of the 90’s era was Mr Pargat Singh formar Team India Captain. In the coming years, those teams will dominate and win, who have developed and built their soft skills and effective decision making, during the run of play under pressure. The fact is; physical fitness gap among the teams has narrowed. And almost diminished. For Example; why Is South Korea – both men and women - not as strong as they used to be? Their high level of fitness and work rate helped them climb the FIH Ranking ladder. Their Men team had won a silver medal at the 2000 Sydney Olympic Games and Women Silver at the 1988 Seoul and 1996 Atlanta Olympic Games. Now, as the other teams have improved their fitness level, they have been pushed to the back seat. Especially Men, who did not qualify for the 2016 Rio Olympic Games and the 2018 Odisha HWC. A new wave is on the rise. The game is changing and improving. The traditional soft skills are making a comeback, although slowly but steadily. We could see them being demonstrated by only the top teams. The final gold medal match is a classic example. I have no hesitation in saying, that the way the top players and teams were executing soft skills, is still in an embryo stage. They have a long way to go. Mind you these top coaches are very intelligent and will develop them quickly. As long as they patiently remember, Rome was not built in a day. It will be a shame to see, the hockey playing nations, who were deprived of the medal and a finish in the top 6, at the 2018 Odisha HWC, for not being able to recognize and anticipate this powerful change. The time is now to start developing the soft and hard skills to achieve tactical creativity, from the bottom to the top, so one is not caught napping. Well, you be the judge? Has any current team, been able to integrate DEXTERITY in to their game? Have the Asians been able to play the game with dexterity? There is a place and time for every skill to be implemented, during the run of play. The wisdom is in knowing, which one to apply, when, where and why. With Why being critical. Knowledge – game sense – is the foundation for critical thinking, problem solving and effective decision making. We need to develop this in our young and upcoming generation of players. And their coaches, too. This is a missing link – Knowledge gap. Mind you this is not an easy thing to teach. Whereas running practices with a set of drills, making players hop from one cone to the other, is easy for the coach and looks good, but has its limitations in developing intelligent players. It does not teach the players to read the game situations, anticipate the plays, 3 -4 moves ahead, like a chess player. But, the quality of time and effort invested in developing intelligent vs robotic players, will be worth it. As you will harvest rich dividends. Quote: In short, the better (Superior expert) players had a more highly developed ability to interpret the pattern of action on the field. This ability allowed them to perceive which players’ movement and interactions mattered most, which allowed them to make better decisions about where to go on the field, when to pass the ball and to whom, and so on. The key benefit of mental representations (Mental Pictures) lies in how they help us deal with information: understanding and interpreting it, holding it in memory, organizing it, analyzing it, and making decisions with it. - Professor Anders Ericsson is world’s reigning expert on expertise and inventor of 10,000 - hours rule. This is my Plea: Let’s teach our next generation of players, how to be “tactically creative” and not only rely on “Hit and Hope” strategy or just the set plays conversions, to win matches and tournaments. Isn’t this the case now? Let’s be true to ourselves! Isn’t this the present case? Quote: The modern game (style of Play) has guided western nations, win the top honors, at the 2018 Odisha HWC. Western hockey has started winning, but real hockey has begun to lose. In the guise of making it more spectacular, it has also stolen the soul of hockey and this pierces through my heart like a dagger. We should not forget that we were under scrutiny and on the brink of being excluded from the Olympic Games. -Tejinder Singh Aujla, Indian born Canadian citizen, who has played at the highest level in India and the European professional leagues. With all due respect, I have contradicted the current top coaches and their players. Cruel to be kind. I know there are more than one way to do things. This does not mean that one way is wrong and the other right. This is just my point of view. And this is without prejudice, what I believe. Quote: Studies of human cognition have indicated, when people grapple with opposing insights, they understand the different aspects of an issue and come up with effective solutions. -Authors of the book; Extreme Toyota. And this is what I – we - am trying to achieve. No question, we have improved; Come a long way and still have a long way to go, to reach even close to our true potential. Where we will see the optimum balance of hard and soft skills, while being tactically creative. This will result in hockey being at its best. 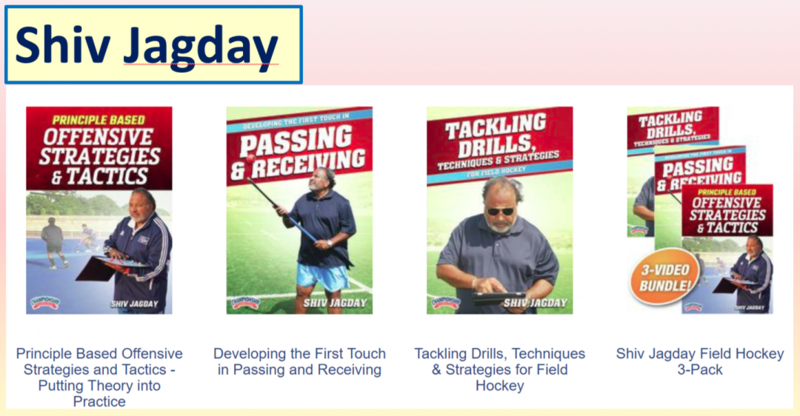 Shiv Jagday, former Canadian and USA National team coach, is a recognized FIH Coach. I recommend these videos to any coach or player who wants to learn more about skill development in hockey and improving themselves. - Barry Dancer, FIH, Master Coach, and the only coach who has guided Australian Men’s national team, win an Olympic Games Gold Medal. In his inimitable style of friendly interaction with his pupils, Shiv outlines the basic purpose of the exercise, identifies the fundamental elements involved, explains clearly the techniques required, and demonstrates each component thoroughly before guiding his pupils step-by-step through the drills devised to learn and practice the skills. At each stage, Shiv points out how and why there is a breakdown in its execution, gently encouraging the players to try again and then positively rewarding the players with accolades for success in mastering the skill.